Available in 7075, 2024, 6063, and 6061 alloys, Clinton’s aluminum flat bar accepts applied coatings well, and depending on the alloy offers excellent joining characteristics. Aluminum bar products are manufactured by heating a square ingot of aluminum, passed through rolls into coil shapes, and then reheated to create the bar shape. Flat bars are a rectangular and flat aluminum product with squared edges and can have any number of flat sides. Aluminum bar stock is available in square, round or rectangular extrusions in a variety of sizes. Please call 800-826-3370 for aluminum flat bar prices and stock availability. 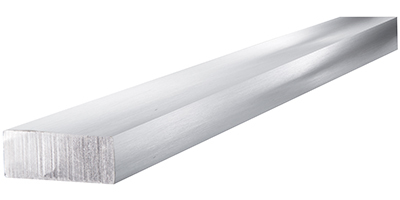 Aluminum flat bar is such a common product in everyday life that it is easy to ignore. Aluminum bars are used in the creation of aluminum wire for electrical applications, airplane structural components, structural support, transportation, decorative pieces connecting pieces of machinery, automotive parts, and even computer parts. Certain corrosion-resistant alloys are suitable for underwater or marine applications as well. Different alloys give each bar product different strengths and weaknesses, meaning that the correct alloy must be chosen for each use. 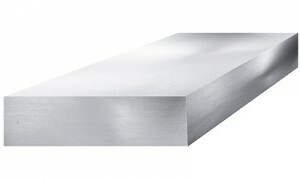 Our aluminum flat bar products are ideal for machinists who want to create strong physical and mechanical designs, while also working with an alloy which is low in weight. Aluminum is one of the lightest materials available today while still maintaining a high strength-to-weight ratio, and it is frequently cheaper to use and produce than comparable steel products. Aluminum materials are generally highly resistant to corrosion, which allows them to be used in a greater number of applications. The 6061 alloy flat bar is useful in applications where corrosion resistance is critical and the material needs to be light. It is frequently used as a framing piece in structural applications, as a mounting plate, and as a supporting piece. It is also used in the creation of motor components. The 6063 alloy flat bar is easily extrudable and because of its polished surface appearance is frequently used for architectural applications. It is highly resistant to corrosion, which contributes to its use in architecture. Common uses include pipe railings, stair rails, and windows. Because of its electrical conductivity, it is occasionally used for electrical engineering. The 7075 alloy has one of the highest strengths of all aluminum alloys. It has an average response to welding and being machined. Its most common application are in aviation and marine settings where its strength supports critical components.